Sept 15, 2014 – Horses today – nature tomorrow – We had one beautiful ride – 2 hours through my own neighborhood – well, not a neighborhood, but more like my own Island Outback!! Practice makes perfect – – Me and Perla are getting better – I say “Get up on the table and stay there until I say get off” — And that she does. The problem, Perla says in her own way “I will get off when I am damb well ready!” I have waited for what seemed like an hour – then she gets off! 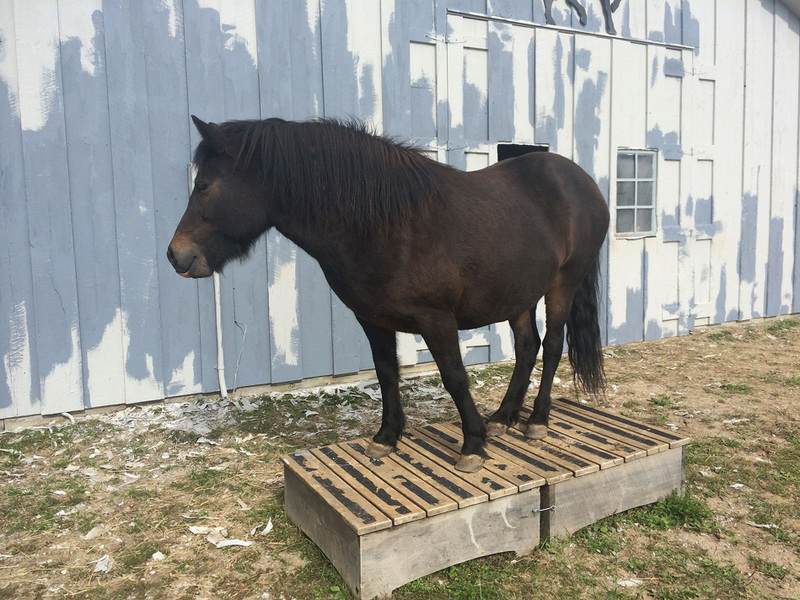 In my pasture – we are getting ready for the trail ride. You know I used to go hunting with friends and more then once we traveled miles to the good hunting spot and then realized we left our guns back at camp — and my mind was young then!!! Today we forgot our bridles at the other barn, but it was because our minds are old!! We train well — bridles are not required – halters will do — and they did! What do you think of that? 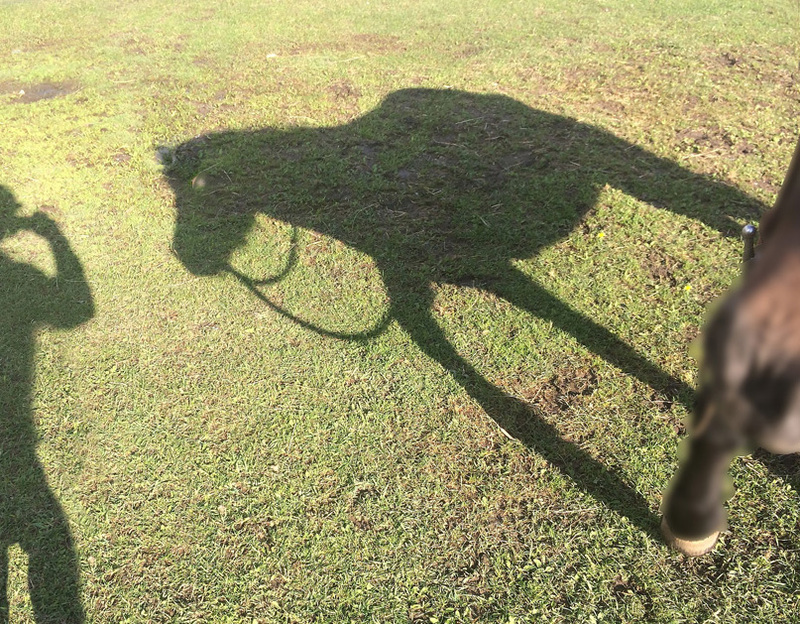 While trying to decide what to do with no bridles I decided to be a photographer and capture me and Perla as a shadow. Our ex-president said “There’s nothing better for the inside of a man than the outside of a horse.” by Ronald Reagan — That was a little deep, but Daniel Boone made straight talk.” All you need for happiness is a good gun, a good horse, and a good wife.” I am in great shape! 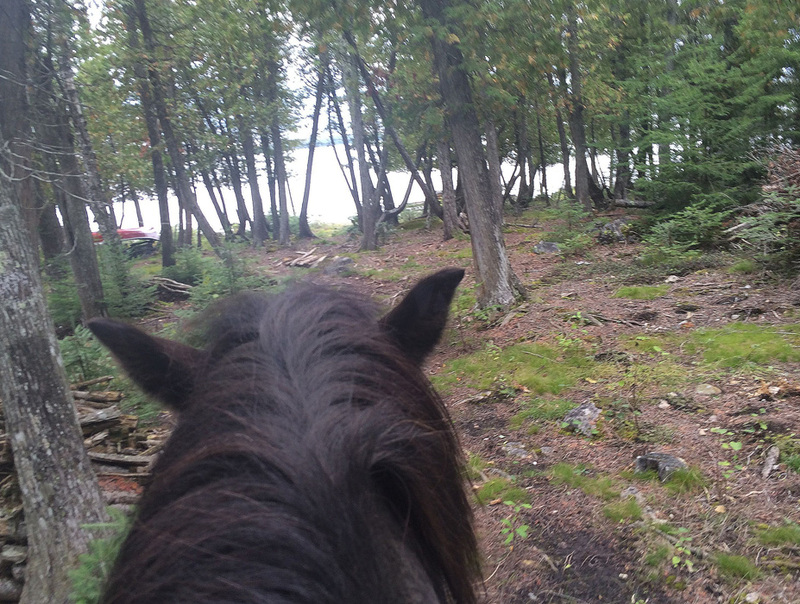 But we rode through the woods, passed our whitney Bay, on to lake Huron – Here we are! 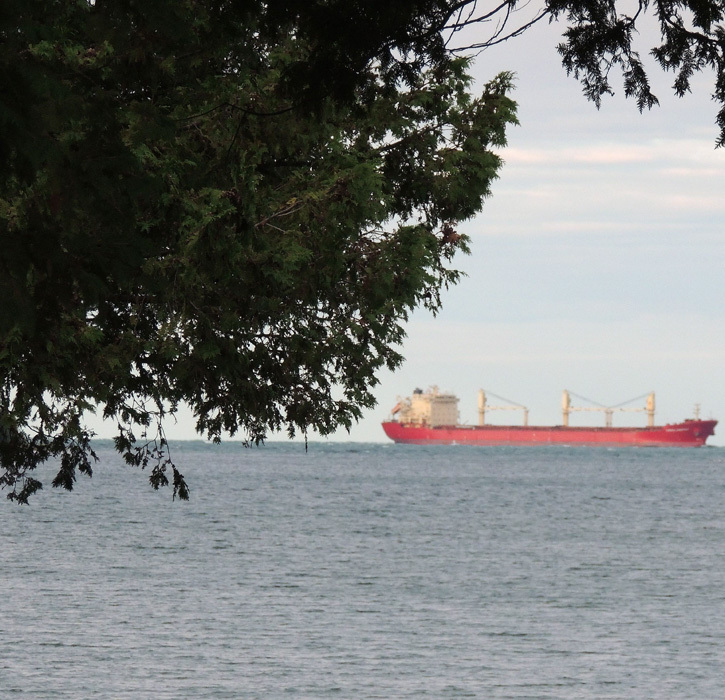 With my super tele-photo lens, I know we are are there, because, I see a bright red freighter off in the distance heading for the Soo Locks and on to Lake Superior. I learn much on every trail ride – Am I the Donkey or is Perla the donkey? – today we came to a little run-off in the trail – no more then 6″” across and no more then 3″ deep — Perla had just wadded through a puddle that was a foot deep and 15 feet across – no problem — but the run-off caused her to go bonkers – ballistic is more like it … jumped like a rodeo bronco – I held on and then all was well on the other side????????? She is a real donkey say I. Bye for now.